a. Continuously failing to provide proper supplies, gear, equipment, provisions and necessaries to insure BOUNTY was in a seaworthy condition. b. Ignoring unmistakable evidence of rot and deterioration existing at the 2012 dry- docking, and the clear adverse consequences of concealment rather than proper corrective repairs. c. Ignoring the warnings of project manager Kosakowski that BOUNTY not be sailed in heavy weather. d. Ignoring the repeated warnings of crewmembers between departure from Boothbay to departure from New London, that the bilge pumping system was deficient and the most likely cause was the failure to have cleaned debris in the bilges from the yard work. e. Ignoring the warnings of National Hurricane Center, Marine Advisories, news and other media (“public warnings”) as to the approach of the largest Hurricane in the century and taking BOUNTY to sea. f. Allowing BOUNTY to proceed to sea contrary to public warnings about SANDY contrary to the “moored attraction” limitations imposed in her USCG certificate. g. Allowing BOUNTY to proceed to sea contrary to public warnings about SANDY with a vessel known to have a deficient and inadequate bilge pumping system which was further compromised by debris in the bilges, and whose back-up hydraulic and gasoline powered pumps had not been operated, tested or overhauled in years. h. Allowing BOUNTY to proceed to sea contrary to public warnings about SANDY with a voyage plan that intentionally violated the fundamental principles of hurricane avoidance (i.e. the 1-2-3 Rule) and which violated the mandate Never to Cross the “T”. i. Allowing BOUNTY to proceed to sea contrary to public warnings about SANDY without the resources and radio electronic equipment which would have allowed the application of the aforesaid rules for hurricane avoidance. j. Allowing BOUNTY to proceed to sea contrary to public warnings about SANDY with an untrained, unprepared and inadequate size crew of “green seamen” who were not trained in abandoned ship procedures. 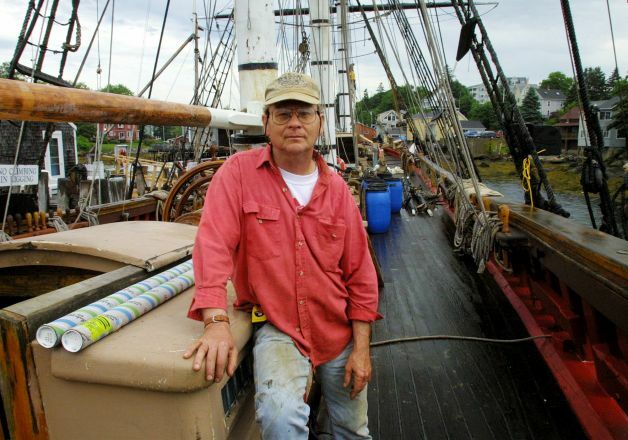 k. Allowing BOUNTY to proceed to sea contrary to public warnings about SANDY with a vessel whose framing and planking was known to be rotted and deteriorated, the full extent of which was undetermined. l. Allowing BOUNTY to proceed to sea contrary to public warnings about SANDY with a vessel known to have incorrect fuel oil filters and with a vessel whose day tanks contained unfiltered and contaminated fuel oil. m. Allowing BOUNTY to proceed to sea contrary to public warnings about SANDY with a vessel whose planking was caulked with cheap non-marine materials and who caulking was largely performed by non- professional caulking personnel. n. Allowing BOUNTY to proceed to sea contrary to public warnings about SANDY with a vessel lacking proper electronic communication and weather receiving equipment and whose satellite phone and high frequency radios were not tested. o. Allowing BOUNTY to proceed to sea contrary to public warnings about SANDY with a vessel which was modified in violation of her Stability Letter by the placement of excessive and unsecured lead weights and liquid tanks to an aft position thereby warranting imposition of the Pennsylvania Rule. p. Allowing BOUNTY to proceed to sea contrary to public warnings about SANDY with a vessel whose master was manifestly incompetent by reason of having made bizarre public statements trivializing the most dangerous of sea perils – hurricanes and failing to conduct an inquiry to determine his fitness for command. q. Allowing BOUNTY to proceed to sea contrary to public warnings about SANDY with a vessel whose master lacked basic rudimentary knowledge as to weather forecasting, meteorology, oceanography, hurricane tracking, and hurricane avoidance. r. Allowing BOUNTY to proceed to sea contrary to public warnings about SANDY with a shore side support staff unknowledgeable in weather forecasting, meteorology, oceanography, hurricane tracking, and hurricane avoidance and who took on the responsibility of provided and interpreting vital information about SANDY . s. Allowing BOUNTY to proceed to sea contrary to public warnings about SANDY without a competent shore side staff of professional maritime personnel capable of providing 24/7 support for weather forecasting, meteorology, oceanography, hurricane tracking, and hurricane avoidance. t. Following departure New London, ignoring continued and upgraded public warnings and information as to SANDY’s movements which made absolutely clear that BOUNTY should abort and return to the nearest safe port. u. Failing to report to the Coast Guard that irrational and contradictory communications received from Captain Walbridge indicated he was acting in a manner which was detached from reality, highly reckless and likely to cause the destruction of BOUNTY and loss of her crew. v. Failing to send “Pan-Pan and Mayday messages directly to the Coast Guard in a timely manner when her unseaworthiness from flooding was obvious. 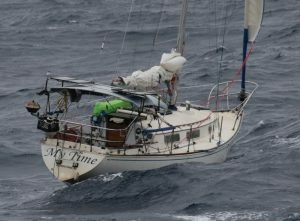 At the outset, such messages should have been sent at least 30 hours prior to her capsizing. w. Failing to send “Pan Pan” and Mayday messages on the occasion of each of the approximate 25 instances of equipment failures, breakdowns, material failures, fires, electrical shorts, power outages, shuts downs, and crewmember injuries cited in paragraphs 50 and 51.
x. Failing to contact the Coast Guard as required by 46 CFR 4.05: at each occurrence in which BOUNTY’S bilge pumps manifested deficient, commencing with departure from Boothbay Shipyard and thereafter. y. Failing to contact the Coast Guard as required by 46 CFR 4.05: at each occurrence materially and adversely affecting BOUNTY’s seaworthiness or fitness for service or route including failure of lifesaving equipment, auxiliary power-generating equipment or bilge systems. z. Failing to contact the Coast Guard as required by 46 CFR 4.05: at each occurrence of a serious crewmember injury. aa. Hampering Coast Guard Rescue efforts by sending or causing to be sent erroneous, misleading and confusing communications stating BOUNTY was “seaworthy”, “not in danger”, “doing great” “ship is doing fine” when in fact BOUNTY was coming apart, progressively flooding, and in extreme imminent danger. bb. Failing to abandon ship in a timely manner prior to capsizing. cc. Intentionally placing the lives of the crew at extreme risk for the sole purpose of financial gain. Get more than any book can offer in the Trash The Bounty thread.